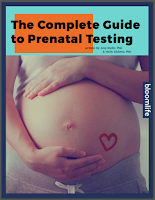 Know Blood Tests During Pregnancy ! 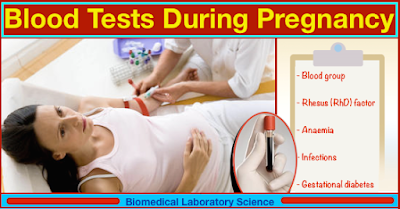 As part of your antenatal care you’ll be offered several blood tests. Some are offered to all women, and some are only offered if you might be at risk of a particular infection or inherited condition. 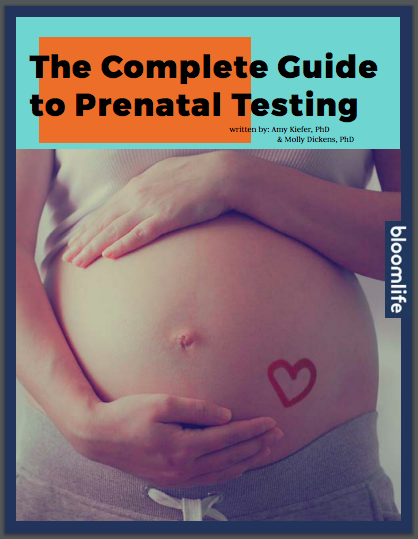 All the tests are done to check for anything that may cause a problem during your pregnancy or after the birth, or to check that your baby is healthy, but you don’t have to have them if you don’t want to. 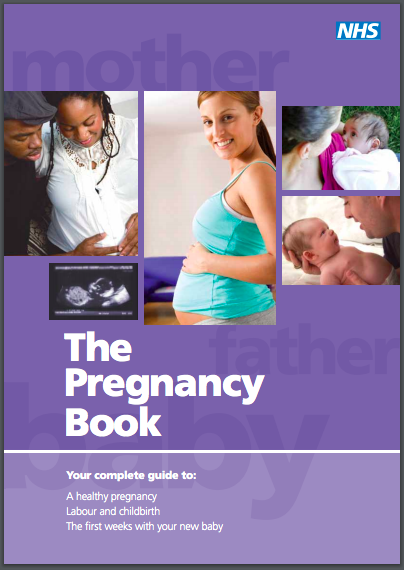 Talk to your midwife or doctor and give yourself enough time to make your decision. They should also give you written information about the tests. Below is an outline of all the tests that can be offered. Thyroid hormones regulate many metabolic and developmental processes, including key having functions in the brain, and mutations in a transporter specific for thyroid hormone leads to severe neurological impairment. This review article attempts to discuss the physiological importance and clinical implications of thyroid hormone transport, with a particular focus on brain development. The thyroid hormones, T4 (3,5,3′,5′tetraiodo-L-thyronine) and T3 (3,5,3′tri-iodo-L-thyronine; also known as tri-iodothyronine) are iodinated amino acids produced and secreted by the thyroid gland. These hormones regulate many developmental and metabolic processes. The nuclear T3 receptors are ligand-modulated transcription factors encoded by two genes, THRA and THRB. These genes encode several receptor proteins, of which three (thyroid hormone receptor α1, thyroid hormone receptor β1 and thyroid hormone receptor β2) interact with T3, which results in tissue-specific and developmentally-dependent transcriptomic changes. In the developing cerebral cortex, 500–1,000 genes are directly or indirectly affected by thyroid hormones. In addition, both T4 and T3 perform nongenomic, extranuclear actions. 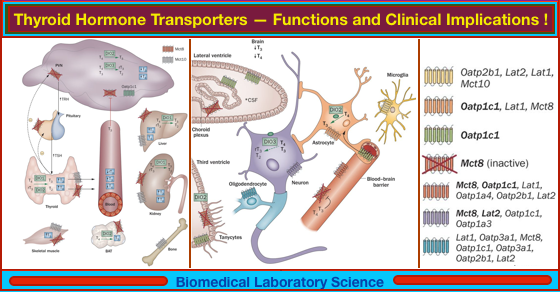 For example, T3 might interact with a plasma-membrane-associated thyroid hormone receptor α variant, and with cytoplasmic thyroid hormone receptor β, while T4 interacts with integrin αvβ3 and activates diverse signalling pathways such as the phosphoinositide 3-kinase pathway and mitogen-activated protein kinase pathways. Metabolism of thyroid hormones includes the processes of deiodination, deamination, decarboxylation, sulphation and glucuronidation, which have been extensively reviewed elsewhere. The most relevant pathway for the discussion in this Review is deiodination, a process that activates or inactivates thyroid hormones. Deiodinases are selenoproteins that catalyze the removal of specific iodine atoms from the phenolic or tyrosyl rings of the iodothyronine molecule. Type 1 iodothyronine deiodinase and type 2 iodothyronine deiodinase (DIO1 and DIO2, encoded by the DIO1 and DIO2 genes, respectively) have phenolic, or 'outer' ring, activity and convert T4 to T3. In extrathyroidal tissues, this pathway generates ∼80% of the total body pool of T3. Type 3 iodothyronine deiodinase (DIO3, encoded by the DIO3 gene) and DIO1 have tyrosyl, or 'inner' ring, activity and convert T4 and T3 to the inactive metabolites 3,3′5′-triiodo-L-thyronine (rT3) and 3,3′-diiodo-L-thyronine (T2), respectively; rT3 is then further metabolized by DIO1 to T2. Serum Iron Test: High, Low, and Normal Ranges ! 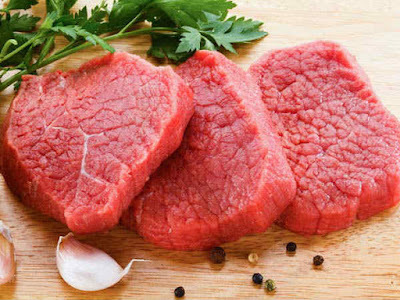 Having too much or too little iron in the blood can cause serious health problems. 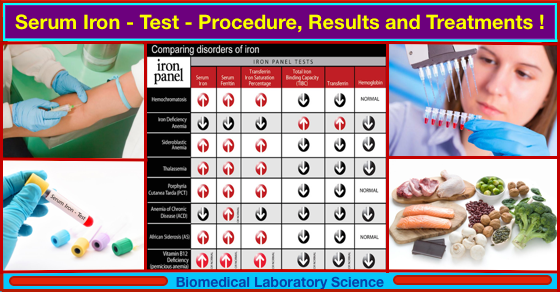 If a doctor suspects that a person does not have a healthy amount of iron in their blood, they may order a serum iron test. In this article, learn more about the uses of a serum iron test. We also explain the normal ranges of iron in the blood and the treatment options for people whose iron levels are too high or too low. H2Oh! 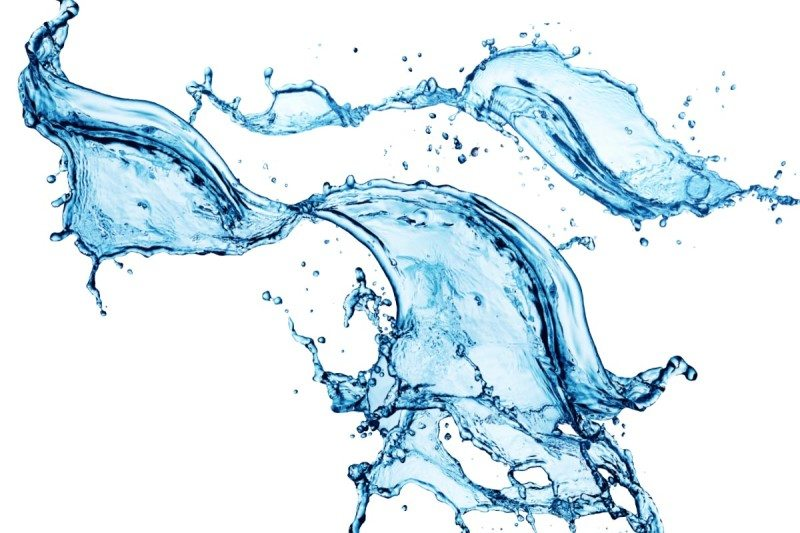 Water is actually two liquids disguised as one. “WATER is very strange,” says Anders Nilsson. He should know: he has been studying the stuff for most of his working life. His claim may be hard for the rest of us to swallow – after all, what could be more ordinary than water? Its behaviour is so familiar, its appearance so commonplace, that we are tricked into assuming that it is more or less the same as everything else. But water is uniquely weird. If it weren’t, none of us would be here to notice. For example, if water weren’t densest at around 4°C rather than as ice, lakes and rivers would freeze from the bottom up, slowly killing their inhabitants. If it weren’t so spectacularly good at absorbing heat, the planet would have boiled over long ago. And if its molecules, barrelling through membranes or darting down veins, weren’t so good at sweeping other chemicals along, plants and animals would die of malnutrition. Scientists have been plumbing the depths of water’s strangeness since at least the time of Galileo, to no avail. But now, thanks to the work of Nilsson and others, we might be on the verge of understanding why it behaves the way it does. Their explanation is as strange and wonderful as the stuff itself: water isn’t one liquid, but two. 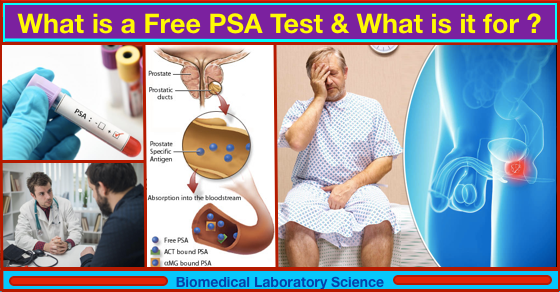 "The free prostate-specific antigen test, known as the free PSA test, is used to help detect signs of prostate cancer. The test measures the level of unbound prostate-specific antigen in the blood, which can help doctors to diagnose issues like inflammation of the prostate or cancer." Free PSA tests are often used alongside other PSA tests to confirm a diagnosis or test results. Free PSA tests can also be used instead of a biopsy if the doctor suspects prostate cancer, but a biopsy may still be needed. This article examines when a free PSA test is used, how it differs from a total PSA test, and what the results mean. Nipah Virus -Infection, Symptoms, Diagnosis & Treatment ! 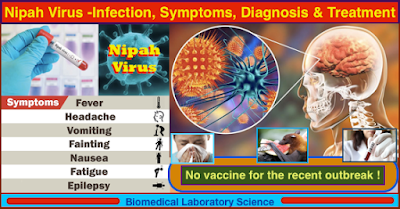 Nipah virus (NiV) is a member of the family Paramyxoviridae, genus Henipavirus. NiV was initially isolated and identified in 1999 during an outbreak of encephalitis and respiratory illness among pig farmers and people with close contact with pigs in Malaysia and Singapore. Its name originated from Sungai Nipah, a village in the Malaysian Peninsula where pig farmers became ill with encephalitis. Given the relatedness of NiV to Hendra virus, bat species were quickly singled out for investigation and flying foxes of the genus Pteropus were subsequently identified as the reservoir for NiV (Distribution Map). 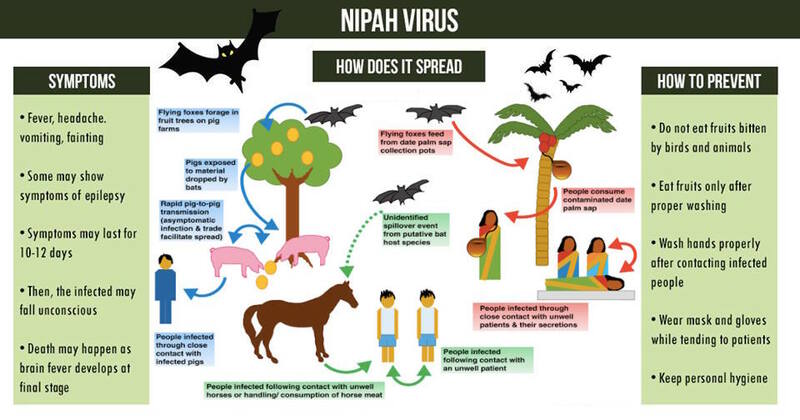 In the 1999 outbreak, Nipah virus caused a relatively mild disease in pigs, but nearly 300 human cases with over 100 deaths were reported. In order to stop the outbreak, more than a million pigs were euthanized, causing tremendous trade loss for Malaysia. Since this outbreak, no subsequent cases (in neither swine nor human) have been reported in either Malaysia or Singapore. As anyone who has ever had a UTI knows, such infections are supremely uncomfortable. They are caused by the intestinal bacterium Escherichia coli,which makes its way from from the urethra to the bladder. Nearly one in every two women will experience a UTI at some point during her life, but men can get them too (though less frequently). Scientists have wondered how these microbes are capable of withstanding urinary flow, but new research from the University of Babel and ETH Zurich shows these tiny critters have evolved a rather clever trick in the form of built-in grappling hooks. 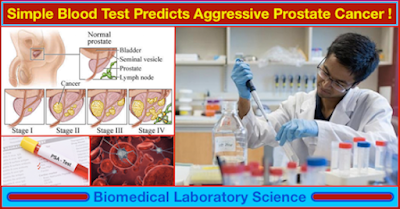 Simple Blood Test Predicts Aggressive Prostate Cancer ! A new diagnostic will allow men to bypass painful biopsies to test for aggressive prostate cancer. Current tests such as the prostate specific antigen (PSA) and digital rectal exam (DRE) often lead to unneeded biopsies and more than 50% of men who undergo biopsy do not have prostate cancer, yet suffer the pain and side effects of the procedure such as infection or sepsis. Less than 20% of men who receive a prostate biopsy are diagnosed with the aggressive form of prostate cancer that could most benefit from treatment. A newly developed diagnostic will allow men to bypass painful biopsies to test for aggressive prostate cancer. The test incorporates a unique nanotechnology platform to make the diagnostic using only a single drop of blood, and is significantly more accurate than current screening methods. 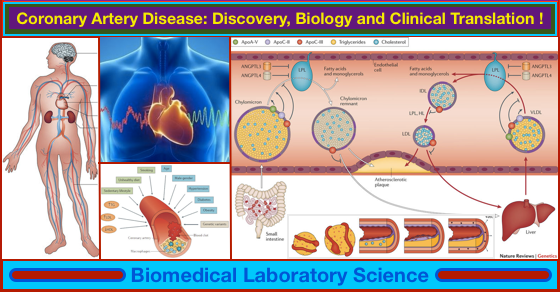 Genetics of Coronary Artery Disease: Discovery, Biology and Clinical Translation ! Coronary artery disease is the leading global cause of mortality. Long recognized to be heritable, recent advances have started to unravel the genetic architecture of the disease. Common variant association studies have linked approximately 60 genetic loci to coronary risk. Large-scale gene sequencing efforts and functional studies have facilitated a better understanding of causal risk factors, elucidated underlying biology and informed the development of new therapeutics. Moving forwards, genetic testing could enable precision medicine approaches by identifying subgroups of patients at increased risk of coronary artery disease or those with a specific driving pathophysiology in whom a therapeutic or preventive approach would be most useful. Coronary artery disease is a heritable disorder that remains the leading cause of global mortality despite advances in treatment and prevention strategies. Human genetics studies have started to unravel the genetic underpinnings of this disorder. Gene discovery efforts have rapidly transitioned from family-based studies (for example, those that led to the discovery of familial hypercholesterolaemia) to large cohorts that facilitate both common and rare variant association studies. Common variant association studies have confirmed ∼60 genetic loci with a robust association with coronary disease, the majority of which are of modest effect size and in non-coding regions. Rare variant association studies have linked inactivating mutations in at least nine genes with risk of coronary artery disease. Human genetics and large-scale biobanks can facilitate drug development for coronary artery disease by highlighting causal biology and helping to understand the phenotypic consequences of lifelong deficiency of a given protein. Genomic medicine may provide patients and their health care providers with genetic data that will aid in coronary artery disease prevention and treatment. Genome editing to introduce mutations that are protective against coronary artery disease into the population could prove curative with a one-time injection, although substantial additional work is needed to confirm efficacy and safety, and to address the underlying ethics. Observational epidemiology and translational research efforts have led to significant progress in improving the understanding of the pathophysiology underlying coronary artery disease (CAD). Prevention and treatment strategies developed on the basis of this knowledge led to a >50% decrease in age-adjusted CAD mortality rate in the United States between 1980 and 2000. However, despite these advances, CAD remains the leading global cause of mortality. Current predictions estimate that more than 900,000 individuals in the United States will suffer a myocardial infarction (heart attack) or die of CAD this year. This review outlines research efforts to understand the genetic drivers of CAD, the role of human genetics in catalysing CAD drug discovery efforts and the promises and challenges of integrating genetic information into routine clinical practice. 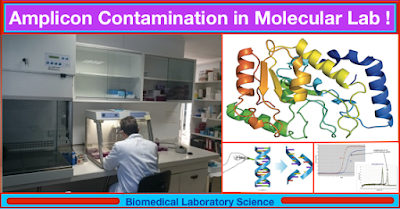 Strategies for Preventing Amplicon Contamination in Molecular Laboratory ! The high sensitivity of the polymerase chain reaction (PCR)—theoretically with lower limits of detection as little as a single template molecule; practically, 10 to 100 copies for many assays as run—is one of its greatest strengths, but also its greatest weakness. As the method works through creating copies of its target, any positive sample can lead to large numbers of molecules which can in turn contaminate subsequent reactions and cause false positive results. To get a sense of the scope of this, consider a successful “average” 25μl PCR somehow getting opened and spilled in the lab. This would contain on the order of 10^12 template copies (amplicons); in other words, if a thorough cleaning reduced this by a million fold, you’d still have a million amplicon copies “floating around,” each of which could contaminate a reaction. If you’re fortunate enough to have never experienced this first-hand, you can thank the widespread acceptance of real-time PCR methods, which do away with having to open reaction tubes post amplification, and perhaps gain an appreciation of why anyone who has been through the experience treats the risk as real and ever-present. READ/DOWNLOAD e-BOOKS HERE ! Start Download - View PDF ! 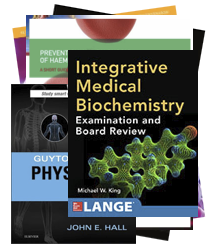 Watch Biomedical Videos HERE ! Check HERE to play Vitros@5600 Chemical Analyzer ! Nepal Grameen Bikas Bank (NGBBL) FPO Result, Check if You're Lucky! Support Microfinance IPO Allotment by Lottery, 10 Kitta Shares to Elligible Applicants ! Siddhartha Equity Fund Allotment Concludes, Check Your Result Now! VITAMINS: The Micronutrients in Our Body !